In the long run Bacon’s Figures aren’t wracked bodies at all, but ordinary bodies in ordinary situations of constraint and discomfort. A man ordered to sit still for hours on a narrow stool is bound to assume contorted postures. The violence of a hiccup, of a need to vomit, but also of a hysterical, involuntary smile. Bacon’s bodies, heads, Figures are of flesh, and what fascinates him are the invisible forces that model flesh or shake it. This is not the relationship of form and matter, but of materials and forces; to make these forces visible through their effects on flesh. . . . What fascinates Bacon is not movement, but its effect on an immobile body: heads whipped by wind, deformed by an aspiration—but also all the interior forces that climb through flesh. To make spasm visible. The entire body becomes plexus. Through these traps, art paradoxically liberates forces, draws them from where they are in the real, and translates them into blocks of sensation. All the contributors brought together in Trickhouse, Volume 7 are obsessed with different impersonal, often imperceptible forces: intensities of great monochromes of color that appear and reappear with subtle shifts in saturation across continents and over many years, inexplicably coordinating and marking events of diagnosis and treatment; mounting nervousness in the body produced by screeching rhythms of machines, arguments, traffic, b-movies, feedback loops, silenced speech and torsos; frenetic speeds of habitual perception in the present and attempts to modify perception through slownesses; two or more sensations seizing one another: the body and the book, and the germinal potential of debris after a wreckage of language; gendered, silent witness actualizing, making present, the event of war and colonization; the ubiquity of the modern image and the reduction of the senses to the visual; urban life under the pressure of technology, life as an auxiliary to the city; the carving of bodies out of territories and then back into the earth again; and the tensions released by music prompting the human to exceed itself, yet giving back to the body diversifying effects enabling what might be called a humanity beyond the human. Each contributor’s work registers forces of matter and incorporeal sensation—not as approximations, illustration, narration or other relationships of resemblance—but through vibrations, resonances, variations. Central to this process is the affirmation of chance, of the accident, and allowing selections made by the artist to be then transformed by its medium: transformed by the actual paint, light, exposure, venue, weather conditions, development of film, the unfolding of a series, a maudlin mood, the errant effect of a computer application or a technical glitch. Elizabeth Grosz writes in her masterful Time Travels that “the imperceptible is that which the inhuman musters, that which the human can sometimes liberate from its own orbit but not control or name as its own: it is that which is unleashed by the force of events, by unexpected impacts, surprising encounters.” At once part of us and yet not ours, art combines the imperceptible forces of the earth, temporality and the respective mediums of the artwork to capture the facts of our everyday lives. The various artists here wrench percepts from subjective perceptions, affects from individual affectations, and memory traces from time, creating new blocks of sensations and lodging them in the artwork. These works produce sensations, creating new visual and sonorous blocks that summon a diversification of perceptual and affective life. They take us out of where we are, and into the expression of sensation residing in the work of art itself. Rohini Kapil sets a variety of formal traps—the series, couples and triptychs—to get at “The Future of Colour.” The subjects themselves are humble. We see modest homes and apartments, small trees, a ragged plant, a lone palm and a patch of sky. 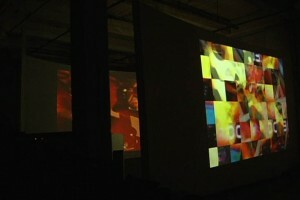 But we feel another intensity, as each series builds a successive perception of its field through great bands of color. Vertically and horizontally in the series and triptychs, these images are crossed by reflections, mirrors or mirages that double and color our vision, moving the eye across individuated fields. Within the frames, the reflections seem almost to produce rays of pure color that pull us into a lime green sky, a warm fuschia block, or a cool blue ray. The colors simultaneously mark the specificity of a present place, remaining rooted to the ground, while always returning to a sky: color becoming light, light dividing into itself. Bands of color brought into zones of proximity with one another produce intensities that bear on her visible subject as very subtle shifts of focus, like “experiments in modern painting: those great, brilliant monochrome fields that take life not in variations of hue but in very subtle shifts of intensity or saturation.” The series of photographs does just the opposite of a mechanical reproduction. Although the images are similar, resonant, each element of the series is unique, drawing its particular difference. The same house but at different moments in time marked by various levels of saturation, or, the same color with a subtle shift in intensity. Color as sensation. In Mili Pradhan's video works, the speeds of rushing, rapidly shifting attention in late modernity are profoundly slowed down, the camera gently forcing altered perceptions of everyday spaces and activities. In her “one hand loves the other :: water :: images :: dreams,” Pradhan’s frame forces us onto the ground, shifts our perceptual perspective to that, say, of an animal, or an infant on the floor (or a body whose perceptions have not been overly organized to habitual ways of seeing). A cut, and we see as an animal might—from a roof or clinging to the side of a wall. On the ground, we gaze for long periods of time at the feet of pigeons, at moments of rest and at moments of heightened activity. Objects, rooms, exterior spaces are both partial and infinitely extended, becoming blocks of color—still—or in a slow blur of motion. One is nearly soothed by the slowness and almost silence; the onslaught of traffic, people, and noise are held back, slowed down accompanied by a low-pitched roaring drone. One is moved into spaces toned down, and quiet, to barely moving or still blocks of color and shapes: bricks, openings, doorframes. A baby cow. A dog answers. The quietness of different perceptual worlds. One simultaneously feels the beauty of everyday activity, chores, movement—cooking, hands drawing water from a well—and at the same time the pressing anxiety of a world outside the frame in its excessive speeds. SeonHyoung Kim highlights the frenetic nature of such worlds, and in particular those dominated by the visual image. “Imagephonic,” a multi-sensory installation, is one example of Kim’s remarkable experiments that chart accumulating forces in the body. On three screens serving as walls for the installation, images, close-ups of the natural world are projected: the motion of water flowing, wind through leaves, replete with intense but soothing light and crisp gentle colors. The images then shift from the mediated natural world to montages from corporate media—the contrast editing emphasizing the speeds and magnitude of images we process each day, such as advertisements and news clips. The ever more familiar barrage of imagery and accompanying sounds increases, as images divide and multiply, pace increasing, creating an animated mosaic simulating the cumulative perceptual stress of visual culture in a world dominated by screens. If Bacon paints the body plexus, experiencing Kim’s installation reminds us viscerally that our bodies are nerve-nets, continually processing sensory datum whether we are conscious of it or no. Abruptly, the montage stops, and blocks of deeply valued color—blues, browns, pinks, greens—all with clear, deep, rich levels of saturation are projected across the space. Two long tables extend almost its entire length, containing rows of speakers that produce tones, bells, static, pulses, screeches as a dancer enters into the projected light. She spins gracefully, slowly. She is dressed in a white. Her garment is wearable computing; the colors play over her. The sensors on the garment do not respond to her movement, but to the blocks of color, as the intensities of light washing over the room and the spectators are translated to sound. At moments, there is incredibly lyrical grace in subdued humming and slow arcs of her arms. And yet, the sound gradually becomes overwhelming, dissonance increasing, as the intensity of the radiant light and the movement of the dancer bring on an unbearable accumulation of sensory intensity. Subjected at every turn, in waiting-rooms, classrooms, bedrooms, bars, stores and highways, the endless shifting colors of screen project onto us; images wash over our bodies, silently affecting the even more delicate sensors of our own eyes and skin—and yet, we need our ears to see it. “Imagephonic” makes this perceptual stress audible. The SimEve existence might well take its soundtrack from Sarah Paul, whose work conjures up our everyday bio and techne, producing pop melodies that sustain harmonic lines even while coupled with jagged dissonances in a kind of “soft subversion.” Sara Paul's songs, densely layered with samples, rhythms, voices, are melodic nets that capture sounds inciting generalized anxiety disorder, resonances of and between past and present places, and variations on experiences, previous songs, interactions from the past carried forward with would-be future voices. In “Test Mash 1,” the beginning of a collaborative work with animator Megan Ehrhart, ambient birdsong and the rush of cars, dopplered music, casual voices lay out the visual space of her Cleveland ghetto while a bell tolls in a small French village in a recent past. The synaesthesia collapses spaces and time, and we hear call to an expansive world stretching out before us. By contrast, in “Shop Crisis,” the industrial sounds of saws, drills, hammers rush around us, madly panning from right to left, as if space itself is closing down, a frenzy of activity rooting the body to a single spot, the music enacting a kind of claustrophobia that produces mental breaks. “Take Over Your World,” commissioned for Penny Lane’s “The Abortion Diaries,” layers voices and synthetic rhythms, creating a sonic gesture. Composed for a documentary of what even the most liberal of us don’t feel able to talk about—physiological and psychological experiences of abortions—Sarah Paul was commissioned to compose music to accompany accounts that “immediately veil even as they express their experience.” In the music, sonic gesture, resonances and variation replace narrative, having realized, in her words, “the ramifications of every choice of every word” in contexts permeated with cultural shame. “Vocal Thought #3” prefigures voices to come from a muted past, as Paul works on an entire chorus to tell the story of Cleveland’s “Torso” murders. Most striking in her work is its ability to elicit visceral, bodily responses, resonating and producing sensations at once ours and yet not our own, but all of which push us forward. Vince Mistretta acts as correspondent, a documentary filmmaker recording the peace movement Women in Black, and the images are startling. Shot in Buffalo, New York, and Rome, we see silent women of all ages protesting United States, Europe and Israel's ongoing wars. To many, these are figures of gendered mourning, women standing as silent witness to the horror of war. We see how they affect the people around them, eliciting furtive glances, shouts of solidarity, insults, and apathy. The film captures more than a rhetorical position—there is no single one. When asked why they stand, the women offer diverse answers, from political beliefs, personal loss, religious obligations and aspirations. There is no single answer, but a multiple hermeneutics, layers of differing reading and meaning. Yet their vigils offer a profound consistency in response, reaction: immediate quiet and respect, or inexplicable hostility and resentment. Mistretta’s film shows the difficult struggle of activism in the face of time—the slowly changing seasons powerfully registering the persistence—not only of their activism but of war, in what Georgio Agamben has termed our permanent state of emergency. Melissa Buzzeo’s work asks how the body survives the enormity of the disastrous event. In “The Devastation,” sensations of rhythm seize upon one another—the body and the book—multiplying in the figure of two lovers after the flood of encounter drains away. These figures are language, but language emptied out. The lines move with tidal rhythms, repetitions, odd rhymes, and then the sudden surges that shift into a cinematographer's tracking shot: “A drawing and a paper and a match/A close up on the drawing./Music in its last moments.” The precise rhythm of the first line pulls us forward. Its content seems concrete; it offers us a list. But it actually effaces the figure under its rhythm, and in the next line we are given only a close-up, a frame without content. The drawing never appears. Just as the drawing is undone, so the poem seems to promise us music, but leaves only a coming of the silence when music is over, when the poem is ruined. What remains are fragmented bodies of books. She writes, “How a book looks left/How a finger looks caught/How a book sags left.” The insistent anapest of the line crashes onto the internal rhyme—book/look—pulled down by the force of the encounter and the weight of the flush of water. “The four soggy books barricading the drain./Eradicating the drain/Coming to claim it caught.” The lovers find and undo each other, and the writing is undone as well: “There was limit which you slept with/There was silence which you slept with/In the bed no longer a book.” The couple and the book, doubled and dissolved in these lines. The struggle of the writing, after the wreckage, becomes the gesture of a “matted reach” of organic life: the struggle of plankton, as her epigraph by Clarice Lispector announces, “love is yet before love: it is the plankton striving, and the great living neutrality striving.” It is the striving of rhythms even after sound stops. Ban returned to India, where her ancestors were from, and lay down, as close as she could get, next to the border with Pakistan. A few feet away, under the gaze of a military presence, two guards a few feet away from the Wagah checkpoint, she simply did this (lie down), then stood up and with a long stick torn from a nearby tree, though the area is desolate, marked the outline. Then she re-filled it with orange and red marigolds purchased, earlier that day, from the Shiva temple of a village further in. It must have been a Monday. We are thrown on those gaps in “Ban en Banlieue.” Bhanu Kapil's Ban renders the force of dispersion and displacement—and the myriad, attendant anxiety, fears, and dislocation of self in another body—palpable as color or a chill, or as the warmth of the color of marigolds. It acts immediately on the nervous system as it actualizes the event, drawing the sensation of displacement and reach and compassion: “Then she sat down next to this body and placed a hand on the place where its chest would be, and another upon on her own.” In so far as we feel that place, we feel Ban. It is not that music is important to us (forceful) because it is, as it were, able to sing the song of who, in our deepest sense, we already are; it is, by contrast that it is important to us (forceful) because it allows us to fulfill the profound need not to be who we are any longer. . . . the reason we no longer feel alienated from ‘our humanity’ when music is in play results precisely from the fact that we are fully wrapped up in something that isn’t human. We are wrapped up in sensation—occurring in the artwork itself. See Elizabeth Grosz, The Nick of Time: Politics, Evolution, and the Untimely (Durham: Duke Univ. Press, 2004). 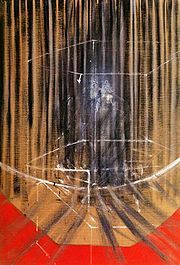 Gilles Deleuze, Francis Bacon: The Logic of Sensation (Minneapolis: Univ. of Minnesota Press, 2002) xxix. For Bacon’s full elaboration on facts, accidents and the process of capture, see David Sylvester The Brutality of Fact: Interviews with Francis Bacon (London: Thames & Hudson, 1987) 53; 17. Elizabeth Grosz, Time Travels: Feminism, Nature, Power (Durham: Duke Univ. Press, 2005) 194. See also Elizabeth Grosz, Chaos Territory Art: Deleuze and the Framing of the Earth (New York: Columbia Univ. Press, 2008). Sarah Paul telephone interview with author, 14 November, 2009. Clarice Lispector, The Passion According to G. H. (Minneapolis: Univ. of Minnesota Press, 1988) 84. Gilles Deleuze and Félix Guattari, What is Philosophy? Trans. Hugh Tomlinson and Grahm Burchell (New York: Columbia Univ. Press, 1994) 176.